Before you purchase health insurance, research your options to ensure you choose a company you can count on—one that cares about helping you select the best plan for your situation, and one that will provide you with exceptional service after the sale. 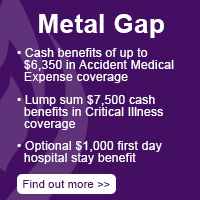 Metal Gap complements major-medical health insurance, providing between $3,500-$6,350 in Accident Medical Expense coverage, lump sum $7,500 cash benefits in critical illness coverage, an optional $1,000 in first-day hospital stay benefit. Short term medical insurance options.